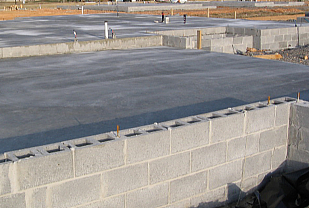 Concrete slab foundations may be formed with lumber or with concrete block. If you choose a block fill slab, you’ll have one extra step. 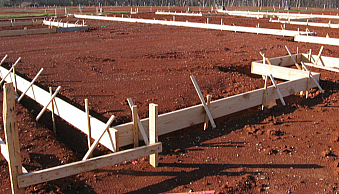 Your foundation contractor will layout, dig, and pour the footings. He’ll return and finish the slab after the masonry contractor lays all the block. If you have chosen to use a framed “monolithic” slab, your foundation contractor will layout and dig the footings, frame the form boards, and get everything ready for a single job in which concrete for the footing and for the floor can be poured and finished in one day. The block-fill slab is a better choice when you wish to achieve a higher floor elevation.